There comes a (sad) time when an aging or “not so successful” 400m sprinter decides to move up to the 800m. Usually it’s the coach who decides this. I remember seeing Adam Steele, the 400 meter 2003 NCAA Outdoor champion from the University of Minnesota, move up to the 800m and never materialized. UK’s Martyn Rooney – 800m in the air? Here’s a good modern day example of an elite 400m sprinter moving up to the 800 meters. On the UK side, Martyn Rooney is a good example. He’s also 6 ft 5 in (195cm), the exact same height as Usain Bolt. Q Why did you take up 400m sprinting? A I was mainly running 800m when I decided to run the 800/400m double at the county championships. After running 1:51 in the 800m, I ran 47.6 for the 400m and I’ve carried on with the 400s. I thought with my height I’ve got an advantage (over 400m) in that I have a big stride. I may not be as quick as the other guys over the 100m but I think holding your stride is just as important. Q Which event do you prefer, the 400m or the 800m? A The 800m is always something I’ve taken a massive interest in. I love watching it. It is the only event I admire more than the 400m. I know how hard it is, how much lactate they must be feeling in their legs. I’ll continue to run the 400m, although maybe in 2010 – in European and Commonwealth year – I might move up to the 800m. And with that endurance background, it is perhaps no surprise that Rooney’s long-term goal is to step up to the rigours of the 800m. "The 800m seems a natural way forward for me," says the European junior 400m silver medallist. I’m not very muscly, I’m 6ft 5in, and you don’t see many 400m runners of my build – but the 800m is perfect. "I’ve only ran it once this season in 1:52.30 but I think I could break 1:50.00 if I did it again. "I’ll focus on the 400m for the next couple of years because it’s tough to step up to the 800m. "But I’m looking forward to it because there are more tactics involved." I could write a book on 800 meter training, or setup an entire website with all the variances of 800 meter training. (I’ll save that thought for another day). There are some articles in the 800 meter archives. Long runs and/or steady state runs, shorter recoveries on intervals, and pace judgment. And don’t forget some form of weight training and circuit training. This was a great article. I coach middle distance and am currently working with a 400/800m runner and 800/1600m runners. I have been doing research on this disapline, 400/800m. I would like to get more info about the type of strength training most 400/800m runners use. Again thank you for this article, great job. @Eric – this is part 1 of a multi-part series… next topic… how much mileage for a 800m runner? A to possibly follow is; Mike Toals approach to 800 meter training, somewhat controversial, however he gets results, only trains 3x per week; an 800 workout, a 400 workout and cruise intervals. I do agree with your analysis that any upward move from 400 to 800 meters must be predicated upon speed, rather than a regression in the 400 meter distance. My two favorite 800 meter performers were Alberto Juantorena and Sebastian Coe. Juantorena was an extraordinary athlete, setting a standard which will be hard to replicate, (400 meter and 800 meter double Olympic championships). Juantorena was tall, strong, and had the stamina of a thoroughbred, as well as fluid speed. I do take exception to the inference that Sebsatian Coe was an underachiever in the speed department. His listed best is 46.87 seconds in the 400 meter dash. I believe that was in his early years, 1979 or before. In 1979, he ran an anchor leg on a 4 X 400 meter relay and ran a 45.5 second leg. In the 1980 Olympic 1500 meter final, he ran the last 100 meters in 12.1 seconds! That is the fastest ever recorded in a championship final. In a 1981 800 meter championship race, he ran the last 100 meters in 11.3 seconds, the fastest ever recorded for that last segment. Incidentally, that would be a pretty fair last 100 in a championship 400 meter race. I believe that Coe could have bested his 46.87 time if need be. In fact, I believe that Coe could have run a 45 second flat 400 meters with a little specialized training. when will the next article, 800m mileage, come out? Andy makes some good points, but I believe Coe’s 45+ relay leg was in ’81. He ran the 46.8 400 in an open race in ’79. Other good runners from the past didn’t necessarily reach their potential in the 400 simply because they didn’t train for that. Peter Snell was strong as a bull when in top form, and running 1:44 on grass almost 50 years ago (and it was “electric timing” it should be added) is certainly the equal of lots of other performances that are faster but were made on all-weather tracks. Jim Ryun ran some decent relay splits as well before he fell apart upstairs (hate to say it, but true) and probably had 45+ ability if he had trained as a quarter miler. People forget he would run his quarter mile legs after having already run several races over the course of the two hours leading up to the mile relay. The great Wilson Kipketer was very sly about not revealing his 400 ability. Joachim Cruz also ran 1:41 and his listed best at 400 I believe is 47+. Big, tall, strong guy at his peak. 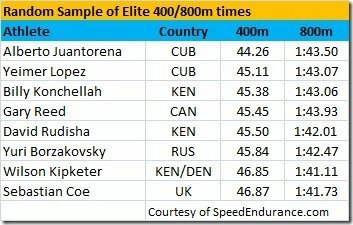 It should be noted that some of the splits for Coe listed above are as big a “guesstimate” as those given for other athletes in similar circumstances, as no official timers or beams are at certain parts of most tracks to record splits, especially pre 1990. For instance Jim Ryun is credited with a 36.4 last 300 in a 3:38 race in Germany back in ’67. Apparently he did run under 37 seconds according to meet officials and German newspapers, but the actual split times for the 100 meter segments are not known, with sources publishing splits given by one observer in the stands as 11.6 down the backstretch. That seems a bit quick. The actual splits were probably more even. He was flying, an interesting note on this exhibition of untapped speed is in the book “Quest for Gold” where there’s one pic of Ryun next to Bodo Tummler and Harold Norpoth at the 1200 in the above race, and the next pic shows Ryun crossing the finish line incredibly far ahead. He did put 4 seconds on Tummler who was a very fast finisher over the last 300. I guess all I’m pointing is out that a lot more athletes had more potential for speed in the 400 than people realize. If Snell had actually done more intervals or such coupled with the mileage he did, it’s very possible he’d have had a quicker 400 PR, never mind taking the two lap record down farther than he did. I would not be surprised if it turned out Kipketer had 45 sec potential. He was a very smooth runner. A machine. Very few athletes flow over the track like he did. 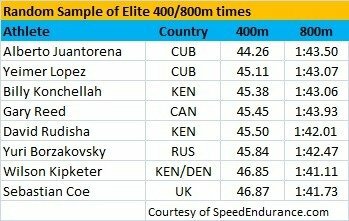 I guess because this is “speed endurance” I should mention that Jeremy Wariner is incredibly smooth, just like Kipketer or Larry James. Biggest waste of talent was Borzakovskiy, who did run 45.8. He hit 1:42 when he was very young, and then wasted years going out slow and trying to finish quick. Yes, he did win the Olympics, give him that. His first 1:42 showed that he had 1:41 potential but he never made use of his gifts when it came to pursuing records. Much to the relief of the Kipketer and Coe fans out there, who like the fans of other runners of yore, have all manner of amazing calculations and estimations to show their man was unbeatable by anyone. Yet their guys did lose. As all athletes do. Speed King for 800 men was El Caballo. Juantorena hands down. A monster. And not a lot of “background” work in comparison the rest of the guys on the list above. When you said “long runs” how long do they have to be? @daniel, for a 400m sprinter, a “long run” is 20-30 minutes in my opinion.